Tony and Linda bought their property at RN 10 Hillcrest Road, Malanda in 2010. They have been planting trees there now for over four years and the transformation of their place is easily visible from the Malanda - Millaa Millaa road. Like most of us, they have learnt and adapted to changing conditions as their plantings progressed. Tony will lead us on a walk around the property and afterwards we'll have a TREAT afternoon tea at their house. This field day is to look at plantings done since the last TREAT field day to the park in 2004. In 2003 a neighbouring property was added to the NP to control cattle wandering into the park and to provide a firebreak between the park and adjacent farms - fire is used at the NP in a mosaic pattern to promote regeneration of native plant species and to help control introduced species. Les Jackson, the Ranger in charge at the park, and his team have now planted 20,000 trees covering 8 hectares on the new section and the trees have come from the Lake Eacham nursery. In the morning we will take the walkway through the trees planted along the Alice River 25 years ago, up to Grassy Hill to view the surrounding area. After lunch, we'll pool into 4WD vehicles and leave from the car park area at 1 pm to drive around the swamp area to the new plantings. Les will be our guide to look at and take a walk through some sections of them. Eubenangee Swamp NP is on Cartwright Road off the Bramston Beach road at Mirriwinni. Meet at the car park on Cartwright Road, just before Alice River. Bring your own lunch, chairs, morning and afternoon tea as desired. Visitors may come for the morning, afternoon or both sessions. This starts the second year of these rambling predictions or 'heads up' as to what might be happening in the next three months. I remind you that previous issues of the newsletter are available on line at Previous TREAT Newsletters. The wet season so far has been a bit disappointing and the models are showing that we are not likely to get above average rainfall in the period of this forecast. The seas in the Indian Ocean and around our coastline are warmer than normal but this is not likely to be of much use to us while southern Australia could have a wet autumn and early winter. Shell Vine or Conch Vine, Connarus conchocarpus, can fruit in most months but this is a good time of year to find their hollow red follicles on the trails around the two crater lakes. If they are bearing seeds there is one per fruit, black and up to half covered in a yellow aril. Connaraceae is a family with only two plants in Australia, little in the literature I have available but widespread around the world's tropics. Mimosaceae, some of the 'fluffy flowered legumes', is an important part of the Australian landscape as it includes the genus Acacia. In the rainforest Brown Salwood, Acacia celsa, has finished flowering and is growing its flat green fruit which will twist as they split. A tree which will flower during this time is Acacia cincinnata. The creamy yellow flowers are followed by tightly twined pods which give the tree its common name of Watch-spring Wattle. While down on the coast keep your eyes open for the broad pale leaves of Acacia mangium which flowers white at this time of year. Introduced from Cape York forms, this plant is a useful timber and firewood tree in many parts of the world and I am glad to report that unlike many of our exports does not seem to have become a pest. I saw it being milled in Costa Rica and know that it is grown in Africa and south east Asia outside its natural range. As you start to return up the range the feathery leaves and red seeds of Adenanthera pavonina, False Red Sandalwood, might catch your eye. The twisted pods of Archidendron vaillantii, Salmon Bean, are sure to attract attention if you come across them in the rainforest with their red outsides, orange insides and black seeds. 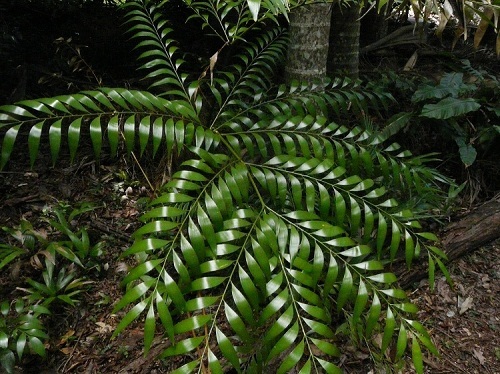 The huge compound leaves are very attractive. This is a wonderful tree for gardens. A restricted vine of the closely related family Caesalpiniaceae is Caesalpinia robusta which is known as Mother-in-law Vine or Dinosaur Vine. The stem is corky with climbing spines often retained into maturity. Fruit will fall over this period; they are dry spiny pods containing one or two very hard purple seeds speckled lighter. Many trees flowered well this year and set lots of fruit only to drop most of it, presumably because of the dry conditions which have also hampered our plantings when we haven't been washed away. The Melicopes and many figs have held their fruit. 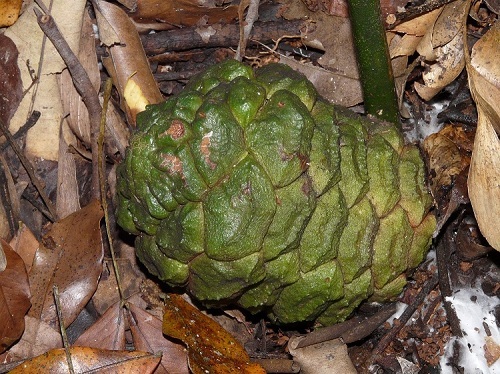 Bowenia Bowenia spectabilis cones ripen in April and May. It is a poor season for Acronychia but there will be some for you to make jams and other sweet things from the Lemon Aspen. It is a real shame to have such a poor season now as the populations of many of our fruit eating animals are only just making decent recoveries from the two cyclones Larry and Yasi over the last nine years. Hypsies and the large fruit pigeons are being seen in numbers approaching their pre-Larry occurrences. White-headed Pigeons and Topknot Pigeons can be seen at this time of year feeding on exotic trees in Malanda and Yungaburra. It has been a great summer season for northern hemisphere migrants except at the once iconic Esplanade in Cairns which is continuing to be destroyed by sand dumping. By the time you read this nearly all these birds will have gone north to breed. However I am prepared to predict an influx of Australian nomads like we have not seen since 2002 because of the drought to the west. We will see large numbers of raptors and a fair variety. Look out also for things like Diamond Dove, Red-browed Pardalote, Little Corella and even Galahs. Simon Burchill is an unassuming member of TREAT, so who would think he had a coffee fetish!! 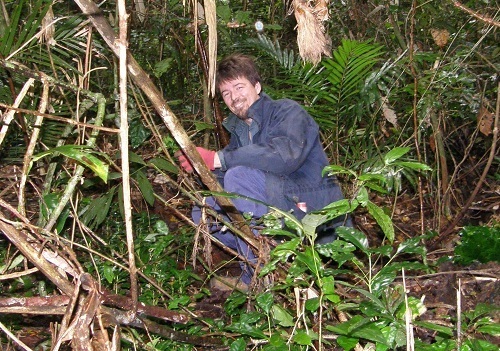 However, since 2010 Simon has been actively looking for invasive Coffee plants in the National Park around Lake Barrine and Lake Eacham. As a member of Tablelands National Parks Volunteers, I was helping Simon last year at a working bee at Lake Eacham. The coffee plants really like the rainforest understorey and often large trees are found surrounded by a 'plantation' of juveniles. The latter are easy to pull out but the larger specimens have to be sawn through and poisoned. They will root again if left on the ground, so are suspended on surrounding vegetation to die, or if close to the road, taken away in the boot of Simon's car. Simon has the skill needed to find these weeds and is quite daring in getting to them through Wait-a-while, stinging trees and rugged terrain. Last year he organised teams of up to 10 volunteers over 13 days to pull and paste nearly 4000 plants, 2000 of these at Lake Eacham in two days, a very impressive effort. The total area covered by Simon looking for Coffee equates to nearly 15 hectares and these areas have been mapped with GPS technology, so the control project has continuity. 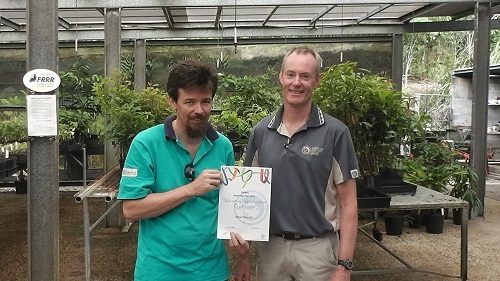 QPWS are very grateful for Simon's efforts, so at a TREAT Friday morning working bee at the QPWS Lake Eacham nursery, he was presented with the QPWS Australia Day Volunteer Appreciation Certificate by Andrew Millerd, Principal Ranger, Tablelands and Dry Tropics. My upbringing in Victoria had more botany in it than any of my mates experienced. My father established an extensive native garden at home in the 50s and 60s (particularly of banksias, grevilleas and eucalypts), and Sunday afternoon drives were often into the bush areas around Geelong on collecting expeditions - my brother and I always took a football to kick around while Dad gathered cuttings and seeds. We were encouraged to try our hand at planting seeds in pots, and transferred anything that grew, out into a space in the garden. My first, as I remember, was a Red-capped Mallee (Eucalyptus dissimulata). This, I now find, is a native of Western Australia, so I can only assume Dad had a correspondent over there with whom he was swapping seeds. That would also explain the inordinate number of banksias. So I was raised to raise plants. But when Pauline and I married and moved to Far North Queensland in 1972, nothing had prepared us for the growing conditions here. Gardening and keeping things alive was no longer difficult, except for the extra weeding. We even grew three kids. And after four years on Cape York and 26 more in Cairns we finally bought our current one hectare property at Jaggan in December 2002 and settled into life on the Tablelands. The property is part of an ex-dairy farm, subdivided in the mid-1980s. It's beside the farm dam, and the previous owners had already started several rainforest plots which were now 15 years old - on the edge of the dam, along the road frontage and one side boundary, as well as a couple closer to the house. We also had a LOT of lawn. I thought that five hours of mowing could be reduced by replacing lawn with more rainforest plots - I wasn't going to plant individual isolated trees as I'm not into mowing in circles. We had plenty to build on, and there were no masses of lantana, tobacco bush and raspberry to remove. So we bought our first twenty trees from Yuruga and put them in at the end of 2003. I knew about TREAT from our time in Cairns (not much, but I'd heard about it). Joining was on my to-do list when we got here, although it took twelve months and some nudging from our next-door neighbours (the Schaffers) to finally get around to parting with my $10 and turning up at the Lake Eacham nursery for the first time in January 2004. I learnt some more about seed preparation, potting and planting out, although much of it was an extension of what Dad had taught me. What was new knowledge for me was rainforest ecology, wildlife corridors and of course the vastly different species here. I also learnt not to use cardboard as a weed suppressor on a slope - torrential rain got underneath and slid all my first planting into the chook yard! My learning, through discussions with more experienced planters, included putting only 30-50 trees in each year - that's as many as you can maintain, given that you'll be doing so for two or three more years, especially if you're still in the work force. Plant them close enough to get quick canopy closure, but not so close that they'll fight - I settled on 1.5m spacing. Fertiliser is good, but attracts bandicoots that'll dig out your trees to get at it, so tree guards might also be needed. Use lots of mulch. I finished up buying a watering wand that is pushed in beside each tree and waters around the roots - it means individual watering but it gets down deeper and reduces surface evaporation and the need to water so often. It finally broke during the drought at the end of last year - trying to push it into the baked ground proved too much. The best lessons I've learnt are from community plantings. I can see what preparation has happened, the different techniques used depending on the condition of the site and the compromises that are needed to balance cost, time and other resources available. Just listening to the chatter and comments from other planters, both at work and during the barbecues, is extremely informative. Everyone has an opinion - just sift them to find what you need! I have learnt from my mistakes, and apparently from everyone else's as well. And everyone has dedication; that's the over-riding impression. Each planting is different and brings its own challenges. My first community planting resembled a pottery class, with baked clay to backfill the holes. Another required a fire tanker to water the trees in, yet three weeks later at the same site you almost needed a canoe to get down the track. But most go smoothly, and you need to look closely to see how much effort has gone into making this so. Best of all, you get to lose weight (at least until the barbecue). TREAT's first community planting for this season was at Ian Freeman's swamp. The site is beside Peterson Creek on what is effectively a mini flood plain of the creek. Because the waterway at that point is choked with Para Grass, the flow is readily forced out onto the adjacent flat, which has become waterlogged. As a result, no machinery could access the site for slashing or spraying and the brave preparation team had to brush-cut the grass, then pull it aside by hand to lay bare the drill spots for the auger. At least there was no shortage of mulch! The soil also has a high clay content from years of silt deposit, so the augering was left until late on the Friday afternoon to prevent the removed soil from baking into pottery shards. The 40 or so planters who attended were presented with a plastic cup as we signed on for the planting. "That's to empty the water out of the holes with," explained Angela. Ground water had seeped back into them overnight. And so we started - no clouds, no breeze, and the humidity at ground level was only slightly less than that in the holes. Most of us struggled with the conditions and a number had to retire to the nearby trees for occasional relief. But 1200 trees later we were finished (luckily, so was the planting). There just remained the small matter of trudging back up the hill to Ian's shed for the barbecue. Because of the particular conditions, only about 20 different species of trees were selected for the planting - those that were considered might do best in wet soil. After more than 30 years of TREAT plantings, there are still things to learn and experiment with. Early indications are that even some of those species are struggling (perhaps rice would have been our best bet). Anyway, congratulations to everyone involved, especially the preparation team led by Ian and Mark. Conditions don't get much more challenging than this one. Oh, did I mention the flies? Now that we've planted all we need to at home (six to seven hundred trees later) and the mowing is down to less than three hours, we've been involved with other projects. Pauline is the Girl Guides leader in Malanda and is also involved with the establishment of the recently purchased Far North District Guides camp site at Garradunga. As there is no shade on the tent area there yet, we volunteered to do a planting to eventually provide some. We had been down in December to spray a 250 sq m arc on the north and west sides, which had worked satisfactorily. All that remained was to drill the holes and lay out irrigation gear and then plant the trees. So after the morning planting at Ian's, Pauline and I borrowed the TREAT auger, picked up ten small bales of mulch hay and 120 trees, and headed down the Palmerston Highway. Well, it hadn't got any cooler down on the coast! Still no cloud cover, although we had an occasional breeze and a lady in her 70s from Cairns, to help. We dug the holes and ran the hoses out that afternoon, and spent Sunday morning adding fertiliser, water crystals, trees and mulch before watering them in. The trees were from the Lake Eacham nursery. The seed had been collected from around Eubenangee and grown to be used by QPWS there, but the trees eventually weren't required - so the Guides gratefully offered to give them a home. We headed back up the hill around 2 pm, and the Henrietta Creek swimming hole was never so good! We'll be back again next year to continue the planting, linking it up with the existing coastal rainforest which borders the property. Who knows? Future Guides might even share their camp site with cassowaries. Being a part of restoring our rainforest is so rewarding. The benefits of what we tree-planters do, both personally and environmentally, have been listed so many times they don't need repeating. Because of our climate and soil we can see results quicker than anywhere else in Australia - almost instant gratification. My education has come from the best, including Joan Wright, Tony Irvine and even a session with Geoff Tracey through my last job in Cairns before we moved here. After a few months in TREAT, I inherited the job of Media Officer from Joan. This gives me the chance to promote the organisation to the wider community, to pass on what I've been able to learn and to encourage others to share our passion. So from a childhood front yard of dense and prickly bushes which swallowed countless cricket balls we've progressed to a small patch of regenerating rainforest which already has an adventure trail for our grandkids, and which may in time swallow more cricket balls. The journey continues. South Endeavour Trust was established in 2007 as an independent, not for profit, private charitable trust with the sole purpose of contributing to nature conservation in Australia. The Trust derived its name from our first property: South Endeavour Station, on the Endeavour River west of Cooktown. This 6,700 ha property included a 4,148 ha area under a Nature Refuge and it was the inclusion of the Nature Refuge that attracted the attention of the Trust's founder. South Endeavour Trust currently owns and manages twelve conservation reserves in NSW and Queensland totalling over 150,000 ha. The properties range in size from 22 ha (McKell Road, Upper Barron) to 68,000 ha (Kings Plains Station, 50 km south-west of Cooktown). 100% of the Trusts' paid staff are located and work on our reserves. Head office consists of me and I work on a voluntary basis. To make the greatest possible contribution to nature conservation that we can; which often means doing things that others would like to see done but which they cannot or will not do. For example, the purchase of three properties (including very expensive farming land) to secure the Rock Road Corridor would almost certainly never be done by another conservation organisation but we saw it as securing a very important long term goal. Similarly, we have recently acquired property near the Millaa Millaa lookout and are actively trying to buy the neighbouring property to secure a critical linkage across the 'East Evelyn Gap'. To manage our conservation reserves as well as we practically can. This means making good management decisions based on sound science and then carrying those decisions through into on-ground actions that make a real difference. Our major management focuses are on: seeking to control and reduce the extent and number of weeds; reducing feral animal populations to as low a level as commercially viable; and to use fire as a tool to ensure appropriate diversity and resilience. To ensure that we build and maintain an adequate capital base so the annual income from that capital is sufficient to meet our management costs in perpetuity. We are very serious about managing our reserves in perpetuity and this means that we are very focused on understanding and controlling costs including having regard for future management expenses in considering properties for purchase. As a consequence, we tend to cluster our reserves within specific geographic areas to encourage efficiency in management. The Trust has several Directors including myself, Tim Hughes, and it has been fantastic to meet many TREAT members at the recent plantings on one of our Rock Road properties. To give you some idea of my background, I am an economist, writer and company director. I spent over thirty years in senior roles in the Australian investment management industry and wrote a weekly economics and finance column for the Courier-Mail from 1995 to 2013. But I actually started my career with the NSW National Parks and Wildlife Service and have had a lifetime interest in conservation. I was Chair of the Board of the NSW Nature Conservation Trust from 2006 to 2011. Sadly, Simon Marais, the founder of South Endeavour Trust, passed away in February 2015 after a short but valiant battle with a very aggressive cancer. Simon was the founder and CEO of Allan Gray Australia, a manager of Australian investment portfolios. Simon had been actively involved in conservation for over 20 years and was involved in creating private conservation reserves in both South Africa and Australia. Both Simon's wife and brother have recently joined the board of South Endeavour Trust and his family is totally committed to seeing the Trust continue as a successful model for habitat conservation. To date the Trust has focused on four areas of great conservation need in eastern Australia, each of which has extraordinary biodiversity values. These are: North-eastern New South Wales; the ephemeral desert wetlands of North-western NSW; the endangered highland rainforests of the Southern Atherton Tablelands; and the intersection of the Wet Tropics and Cape York bioregions in Far North Queensland. 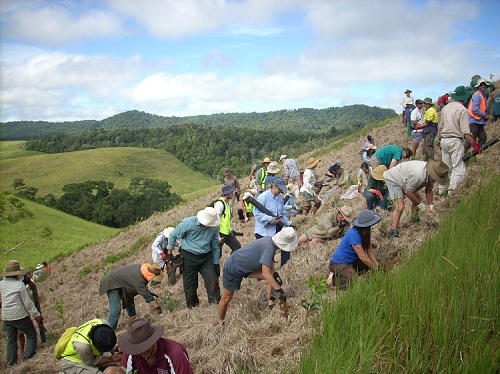 The Trust was attracted to the Tablelands in 2009 by the persistent community engagement efforts of Keith Smith, a local nature refuge officer with the Queensland Department of Environment and Heritage Protection. Our first Tableland property was a 132 ha property at the top of Turner and Seamark Roads, now called Carabeen Creek Reserve, which had been slated for logging. But it has been the outstanding support and energy of the Tableland community, particularly TKMG, TREAT and CVA, that has given us the confidence to purchase four more properties in the area. The Trust's five Southern Atherton Tableland properties, totalling 375 ha, focus on endangered Simple to complex notophyll vine forest of cloudy wet highlands on basalt soils described as regional ecosystem type 7.8.4 or 5a rainforest (Tracey and Webb). 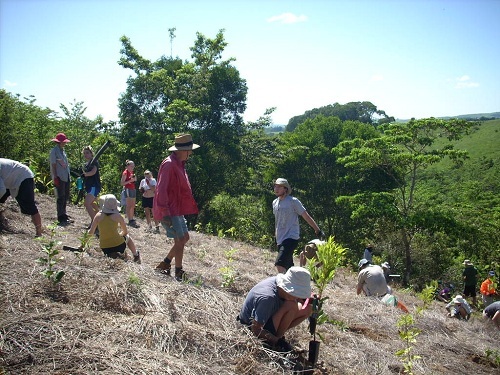 In the Upper Barron area, we are working with community groups including TKMG, TREAT and CVA to revegetate at least 10 ha along the Rock Road Corridor to link about 850 ha of freehold rainforest, including 9 Nature Refuge properties, with the Herberton Range National Park section of the Wet Tropics World Heritage area. This Corridor is vital in enabling a range of endemic birds and small mammals the greatest possible chance of survival in the face of the threats of climate change. To see so many volunteers come along to our planting days has been truly fantastic and has encouraged us to invest further monies at the East Evelyn Gap. We are totally committed to continuing to support the restoration and protection of the Rock Road Wildlife Corridor and the East Evelyn Gap Corridor. 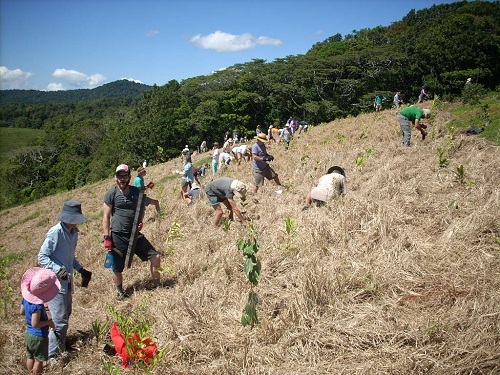 This will see several more years of tree planting in partnership with the local Tableland community. If you want to know more then please check out our web site www.southendeavour.com.au. Unfortunately, as well as everything else, I do the website. Of late, I have been so busy doing conservation things that I have not fully updated it, so a number of our most recent properties are not yet shown but soon will be! This season the rain was a problem - either there was too much or not enough. Three of the plantings were re-scheduled and the Mather's planting is still to be done. It's a small planting so will be done on a Friday morning. 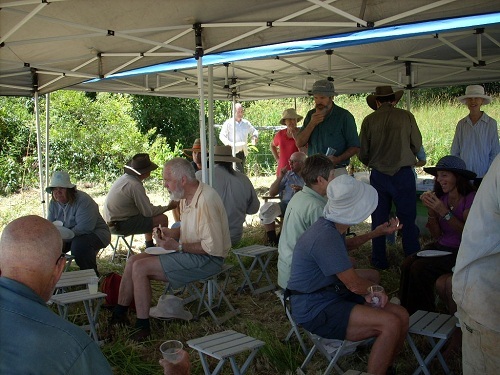 We had good numbers of volunteers, often boosted by the presence of students from the School for Field Studies (SFS), and volunteers from Conservation Volunteers Australia (CVA). The after-planting barbecues were well organised as usual, with plenty of tasty food. Gazebos were erected for extra shade at most of the barbecues, except for the Emms' planting where there was plenty of shed shelter. Ian's creek area planting of 1200 trees was on 31st January and we were congratulating ourselves that we'd timed it nicely, as this swampy area wasn't yet too wet and the trees could do well if the wet season was late or weak. However, a week later, there was a small but very significant influence which dumped about 14 inches of rain overnight, particularly on Malanda, and Ian's catchment area received over 9 inches. This flooded the area planted and Ian and a few friends spent the next morning pulling clumps of dead grass off the young trees to help them stand up. The next planting of 1200 trees was to be on 14th February and was made up of two parts. The first was to infill sections of the previous year's planting where there had been poor survival rates, and the second was to plant a new strip on the north-west boundary. On Friday 13th, Cyclone Nathan was hovering around and rain was expected to increase. It was deemed unwise to have volunteers drive on possibly flooded roads the next day, so the planting was cancelled. Volunteers were intending to put trees out on the Friday, and it was agreed they should instead plant the 600 trees for the infill section. Holes were augered, fertiliser added and the trees planted - in what seemed like record time as several SFS students and CVA volunteers who happened to be visiting the nursery that Friday were eager to help. The expected heavy rain didn't eventuate but the trees did get a good watering. That left the small north-west boundary planting to do, which happened on Friday morning, 27th February. The holes had been dug the previous afternoon. Again, there were SFS students at the nursery who wanted to help, but this time the weather had turned sunny and hot, so the trees were well mulched and also watered - using a tank that QPWS had on a trailer. Ian has been watering them on and off since. It was a wet morning with constant showers for Carolyn and Phil's planting at Cedarvale on 7th February. Their plantings are often on difficult terrain, so they are timed to take advantage of the arrival of SFS students for the first semester of the year - the SFS involvement both helps the community and gives the students practical knowledge about revegetation. Besides TREAT volunteers and SFS students, there were a few QITE trainees plus several members of the Emms family. The planting was on a hillside near the top of a ridge and Phil ferried us to the site in his trailer, fitted with ropes to hold on. Holes had been augered, fertiliser added, and a lot of small bales of sugar-cane mulch dropped in lines beside the strips to be planted. The planting had been reduced to 2000 trees which was fortunate as there was a lot of mulch to be spread around. This was to be done after the trees were planted, and the youthful energy of the students made the job seem a lot easier. It was a great effort. We were all very wet by the finish and the barbecue at the shed on Barrine Park was most welcome. 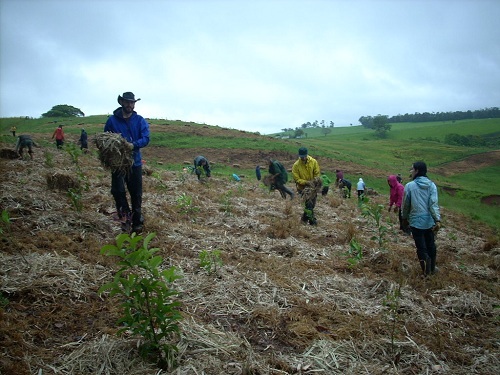 The planting was on the morning of the night when Malanda had their big downpour, and I wondered how much of the mulch and possibly trees had ended up sliding down the hill. Carolyn said she and Phil fixed up a few trees the next morning, but in general the planting was okay and controlling weeds is now her priority. Mark and Angela's planting of 2500 trees was on 21st February and it was a hot, sunny and humid morning. There was a good roll-up of volunteers, over 50, and the planting was finished in just over a couple of hours. It was mainly on both sides of a ridge, near previous plantings, but the sun and humidity stretched the endurance of some of the planters. Mark had prepared the site to his usual high standard, augered the holes with Michael's help and added fertiliser. Trees were laid out the previous afternoon. It had been sunny since the holes were dug and a lot of the soil we put back into the holes was dry. Angela assured us it was going to rain that afternoon, so all would be well. She must have had some influence, because a storm gave the trees almost 3 inches of rain that afternoon, starting just after lunch! After their plantings are over, Mark and Angela always spend a few days putting guards around those tree species which the pademelons love to eat - this year the pademelons even ate some of the laid out trees before they were planted! With the help of a couple of friends, Mark and Angela have added another 1000 trees on the steeper gully slopes near this year's planting. Apparently, with some hot days in between rain periods, some of the trees planted on the more exposed northern side of the ridge are struggling, but most are okay. There were some showers leading up to this planting on 7th March, but the QPWS team were taking no chances with rain and had set up irrigation from the creek. The planting was another infill of the 2012 planting, building on last year's infill planting - the 2012 planting had been damaged by frost and cattle incursions. It was a smaller group of volunteers (just over 20) who came to plant 900 trees. This time all the tobacco trees in the areas for infill had been cut out as some shelter for the new plants was being provided by various pioneer trees. The holes were dug during the week by QPWS staff and with some help from a couple of volunteers, the trees were laid out Friday afternoon. Fertiliser and water crystals were added to the holes on the planting day and despite it being a hot morning, the trees were planted and mulched in a couple of hours. The irrigation was immediately turned on and those trees not reached by the sprinklers were hand-watered by the QPWS team. Although we were doing an infill planting, it was great to see the growth of the trees planted in previous years on the opposite side of the road. With persistence, both sides of the road will soon look like natural forest when we drive past. The three plantings for this site were scheduled for the end of February and the middle and end of March, when we have the best chance of rain for the wet season. The site was very well prepared, but the weather wasn't cooperative. The morning of the first planting (28th February) was very hot and humid, and most of us struggled with the heat and steep terrain. Spirits lifted when the SFS students arrived (they'd been delayed by fuel troubles with one of their vehicles), and the rest of the planting of 2500 trees was completed in an hour. The soil was dry despite water crystals having been added to the holes as well as fertiliser, but we were hopeful of rain. There was plenty of dead grass and we mulched heavily with it, leaving a thinner layer at the base of the plants for any small amount of rain to penetrate down to the root balls. Unfortunately the rain didn't come. Some trees were watered the next week and rain did come, but it was too late for many of the trees. 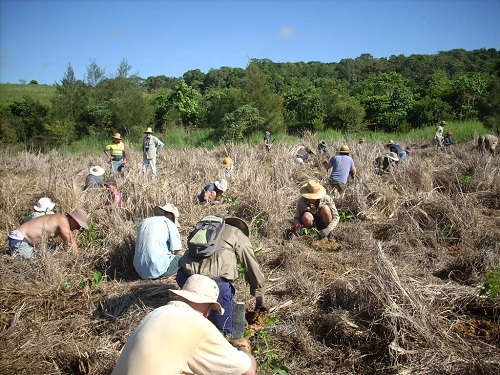 The next planting (14th March) was postponed on account of Cyclone Nathan. Heavy rain forced the decision to not dig the holes as the soil dug out would be washed away. This planting was rescheduled for the next Saturday, 21st March, in place of the small planting at Mather's, and preparations went ahead smoothly. As the SFS students couldn't come, the call was put out for extra volunteers and over 50 planters turned up to plant the 2500 trees. Several CVA volunteers came as they'd helped lay out the trees the previous day. The site had received rain from the influence of the cyclone and the soil was wet under the top layer of hole spoil. The morning was cloudy with a coolish breeze and the planting was finished much earlier than anticipated. As Cyclone Nathan had looped and was returning, more rain was likely so the trees weren't watered. The final planting day (28th March) was again cloudy with a coolish breeze, and both SFS students and CVA volunteers came along to help plant the remaining 1800 trees. By this time Cyclone Nathan and the chance of any more rain had disappeared. Consequently, during the week's preparations, 1000 trees were planted and later watered, when blocks of 200 holes had been dug, to conserve the soil moisture for the trees. 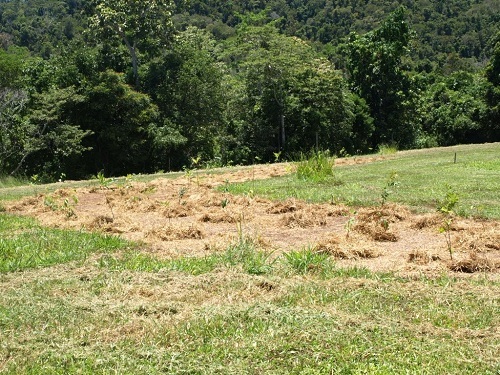 The preparation and planting was done by a Tablelands Regional Council crew and CVA volunteers. A decision was also made to install watering tanks and two gleaming new tanks were positioned atop the ridge. Unfortunately, they'd not yet been filled with water, so some of the SFS students were asked to water the trees being planted using 20 litre drums and buckets. Using an all-terrain vehicle, Mark made trips back and forth to a tank at the back of the barbecue shed to fill the drums. The planting was finished long before the watering, but after the students doing the watering had come up and eaten at the barbecue, they went back to finish the job. What a great group! Over 90 volunteers came this day so the response from the community ended on a high note. 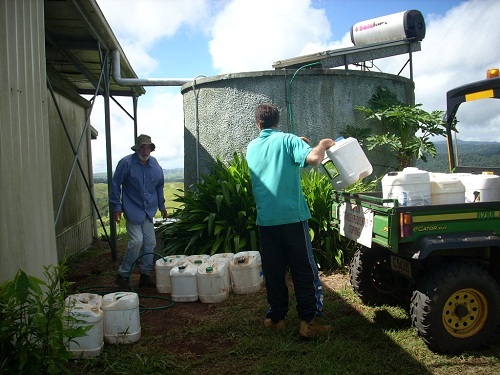 The next week both ridge tanks were filled by a tanker and Mark and a CVA team then emptied them by watering the trees planted on the first and second planting days. Polypipe was run down the hill and hoses used between the rows. Mark said some of the dead-looking trees were starting to reshoot from their bases. For the barbecue last year at Rock Road we were tying the TREAT gazebo to vehicles at the top of the ridge. By contrast, this year we had the luxury of holding the barbecues in the shed on John Hatton's place, now owned by South Endeavour Trust. All plantings are different, but it seems we will have to make allowances for weather events of boom and bust. More contractors could be used to not only prepare sites, but also plant trees at opportune times. But of course, scheduled community plantings will still be held where irrigation is available. With just a few small plantings still to be completed, it looks as though most of the planned plantings this season have been completed with fairly high success. Flash floods and extended hot dry periods were a feature of this year's rainy season (or not so rainy) with some plantings rescheduled or cancelled due to predicted, extreme wet weather events which, although looking promising to deliver much needed rainfall, failed for the most part leaving us to rely on irrigation if it was available. Rainfall prospects for the next couple of months are looking okay for the area and with continued warm weather also predicted, any trees planted to date should continue to establish successfully. QPWS tree plantings on the coastal lowlands have commenced this month with trees being supplied to Ranger Les Jackson and his team for planting at Eubenangee Swamp National Park and to Ranger Audrey Reilly for further revegetation work in the Mission Beach area. For those of you who haven't had a chance to drop into the nursery in the past few months, we have a new (though temporary) staff member, Simon Brown. Simon was thrown in at the deep end at the start of the planting season, when Darren was seconded to QPWS Lake Eacham Management Unit and has been learning the ins and outs of the nursery and rainforest restoration with great enthusiasm. With fewer projects on the boil this year we have been able to cut back on the number of plants being potted and with a further reduction of stock after the main planting season we are now able to continue refurbishing the nursery plant storage racks. This work will commence in April and will also enable us to replace the weed matting and some of the older and not so efficient irrigation components at the same time. This work requires a fairly substantial labour input and will be undertaken with assistance from QPWS staff from Lake Eacham. The weed mat was last replaced in 2006 with assistance from Community Job Program participants employed in the wake of Cyclone Larry.